The Holidays are approaching quickly, can you believe it.. I am amazed that ANOTHER year is close to an end. I swear since I hit 35 time is just flying by.. 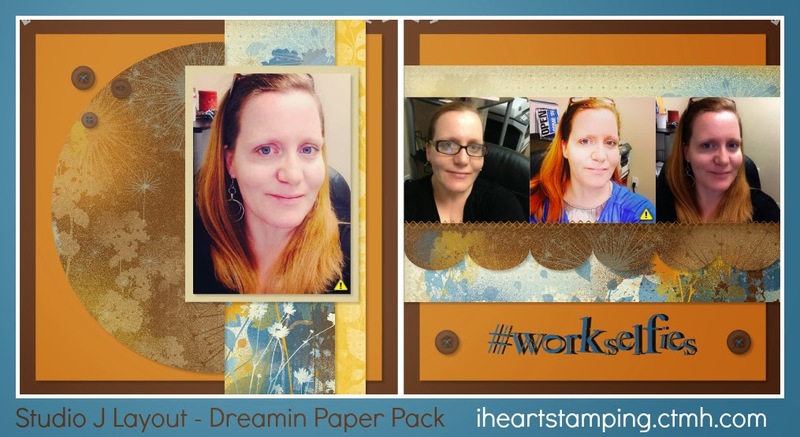 The title of todays post is #workselfies and that is what I am sharing with you. I take selfies at work to share with my husband while he is on deployment, I have no clue why the majority of my selfies are taken while at work but they are. This layout is still a work in progress. I used the Dreamin paper pack and I just love the B&T (Background and Texture papers) in this package. As you can see there is a photo quality error on the photo, so if while creating click on it and it will provide the error. Image resolution at this scale is below recommended settings. This will result in a pixelated printout. If possible, upload a higher-resolution photo. This is just a rough draft, but I thought I would show you a little bit of things that you can encounter in Studio J that will ensure you create a beautiful layout, with the best printing/quality. Another FABULOUS thing about Studio J, is how much customization you can create. use any stick ease and or complements that coordinates with the paper pack. As you can see I added stitching over the photos, you can add different types of stitching choose the thread color. You can add metal elements like photo hangars, hinges and choose the color as well. There are so many options when creating digitally with Studio J. I love every single page I have created and printed in Studio J. They are displayed in a 12x12 flip album in my entry way and I have one layout framed side by side in my hallway. This is a great way to get the photos off of your computer and into scrapbooks and or on display. Thanks for stopping by the blog today! Check out Studio J!